Looking on the bright side isn’t something everyone can do. 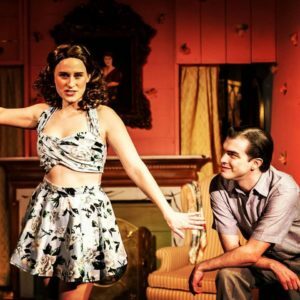 Not everyone can find joy in the face of adversity but in Stillpointe Theatre’s latest offering, Grey Gardens with Music & Lyrics by Scott Frankel and Michael Korie and Book by Doug Wright, shows us there are folks who can. Directed by Danielle Robinette and Ryan Haase, with Music Direction by Ben Shaver, Choreography by Lauren Spencer-Harris, Set Design by Ryan Haase, Costume Design by Kit Crescenzo, and Lighting Design by Adrienne Gieszl, Grey Gardens shows that there are people who can see the light at the end of a dark tunnel and survive even when the world has forgotten them. Some are very familiar with the Beale women and the documentary about an Easthampton mansion named Grey Gardens and some have never heard of such a place or this piece of Long Island history. I was introduced to the Beales a few years back when a very good friend described a 1970s documentary that I just had to watch about these two oddball recluses who lived in a dilapidated 28-room garbage and critter filled mansion with barely any utilities and engulfed in overgrown foliage in Easthampton among the well-maintained houses and lawns of the well-to-do and… I’ve been in love with these two oddballs ever since! Co-Directors Danielle Robinette and Ryan Haase really captured the essence of this piece, which is survival and self-preservation, treating it dignity and respect. The relationship between this mother/daughter duo was so complex, they managed to touch on all the nuances such as the co-dependency and even jealousy these women had for each other. Their casting is on point and the experiment of using two spaces to represent to different times is a bona fide success. There is such a vast difference between the settings and time of Act I and Act II, it totally makes sense to use two separate spaces. Speaking of spaces, Ryan Haase’s Set Design is, in a word, impeccable. He never ceases to amaze me with his original designs and this production is no different. Aside from being in two different spaces, the contrast between Act I and Act II is absolute and really compliments the story of these two women, not to mention, the attention to detail in Act II which adds tremendous value to this already superb production. Another impressive aspect of this production is the phenomenal musicians in the orchestra. this orchestra is spot on in every number and has a very polished, well-rehearsed sound. Music Diretor Ben Shaver not only did a splendid job with the onstage ensemble, he managed to get together a top notch band including himself on Piano, Joe Pipkin on Drums, Stacey Antoine on Reeds, Billy Scaletta on Keyboards, and Andrea Gibeck on Violin. Kudos to each every one of them for a job well done. I can’t overlook the Costume Design by Kit Crescenzo as they are spot on and authentic, adding realism to this production, especially in Act II where the costumes are near perfect matches to the wardrobe the women wore in the Maysles Brothers documentary. Working in such unique spaces, Adrienne Gieszl has to be clever with her Lighting Design and it is absolutely appropriate and befitting to the piece, setting the mood for each scene and number subtly but surely. The ensemble for this production is dedicated and gives a brilliant showing. Bobby Libby makes a great showing as Joe Kennedy with his booming, smooth voice and good grasp of the character while Barney Rinaldi has a great command of the stage and gives a confident performance as the Bouvier patriarch, Major Bouvier. Jon Kevin Lazarus tackles the role of Jerry and his interpretation of this character is absolutely endearing and just made me want to give him a big ol’ hug. Rounding out the ensemble is Terrance Flemming as Brooks and Brooks Jr. and Anne Murphy or Kate Kilner-Pontone as young Jackie Bouvier and Avagail Hulbert or Compton Little as young Lee Bouvier, all who give commendable performances. Also, I’d like to comment on the Choreography by Lauren Spencer-Harris that was absolutely appropriate for the piece adding great value to the piece as a whole. Three actresses lead this exquisite ensemble in this journey through space and time and Edith “Big Edie” Ewing Bouvier Beale is played flawlessly by Zoe Kanter (in Act I as a younger Big Edie) and Danielle Robinette (in Act II as the older Big Edie that was immortalized in the documentary). Both of these actresses seem to really have a grasp on this character as Kanter plays her as whispy and carefree who values family above all, regardless of if it’s falling apart or not, and desperately trying to hold on to her only remaining child so she won’t be alone. And though Kanter is a bit stiff in her performance at times, almost as if she’s thinking too hard, she belts out her songs with a resonating and beautiful belt and she gives a fantastic showing. It’s also worth mentioning the great chemistry with Adam Cooley, who plays Gould, Big Edie’s ever-faithful accompanist, confidant, and friend and gives an admirable performance with a flamboyancy and flair I imagine the real George “Gould” Strong would have been. Playing the role of older Big Edie in Act II, Danielle Robinette, couldn’t have played it better. With a brilliant make up job aging her to fit her character and her slouched posture and limping that was consistent through her entire performance made for a believable showing. Vocally, Robinette gives an outstanding performance, especially with the touching and tender “Jerry Likes My Corn.” Playing a somewhat iconic character can be daunting but Robinette takes this role and makes it her own. Last but certainly not least, there’s Christine Demuth who is the absolute highlight of this production. She embodies both a young Little Edie and the iconic older Little Edie from the iconic documentary, all the while, bringing her own interpretation into the character. Not only does she give an outstanding vocal performance, her acting chops are superb. The subtle but definite change in her character from Act I to Act II is seamless and she plays it to the hilt. The real Little Edie had a very distinctive accent (New England, for sure) and Demuth is on point. From the moment she steps onstage until the emotional “Winter in a Summer Town,” she had me hooked. Kudos to Miss Demuth on a stellar performance and I can’t wait to see more from her. Final thought…Grey Gardens is poignant and compassionate look into the lives of two women time and everyone else seemed to have forgotten but who had the gumption to survive. Whether or not you are familiar with the original Maysles Brothers documentary, Grey Gardens, you will not be disappointed with this production. Stillpointe Theatre has managed to bring a fresh look and feel to this piece and is not only able to express the absolute quirkiness of the Beales with brilliant casting and set designs, but also the tenderness and tragedy of this overlooked piece of Americana. This is NOT an experience you want to miss this season. Get your tickets now! This is what I thought of Stillpointe Theatre’s production of Grey Gardens… What did you think? Please feel free to leave a comment! Grey Gardens will play through February 4 at Stillpointe Theatre, 1825 N Charles Street, Baltimore, MD. For Tickets, go to stillpointetheatre.com for more information or purchase them online. This entry was posted in Reviews and tagged Adam Cooley, Adrienne Gieszl, Andrea Gibeck, Anne Murphy, Avagail Hulbert, Baltimore Theatre, Barney Rinaldi, Ben Shaver, Billy Scaletta, Bobby Libby, Christine Demuth, Compton Little, Danielle Robinette, Grey Gardens, Joe Pipkin, Kate Kilner-Pontone, Kit Crescenzo, Lauren Spencer-Harris, Ryan Haase, Stacey Antoine, Stillepoint Theatre, Terrance Flemming, Zoe Kanter by Jason. Bookmark the permalink.